To find the truth of who you are. Quester is a free spirit seeking an adventure to discover the lessons of each of the archetypes. Quester is expectant and willing to take a risk, has a certain level of naivety, and is completely open and trusting towards the world to be explored. 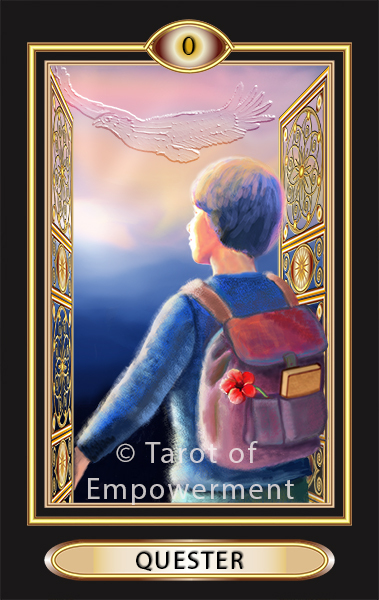 In Tarot of Empowerment, Quester’s task is to go on a journey for knowledge about the lesson of the 21 archetypes represented in the cards. Quester must learn to ask empowering questions. Even more importantly, Quester must listen carefully and learn to integrate the lesson of each archetype. Quester knows that all the cards are useful and necessary, even though some of the energies represented by them could be challenging or difficult. Quester carries all that is needed: the pack of life experiences, the book for wisdom, the flower of relationships, and the eagle, the totem guide. Upright: When this card comes up for you in a reading, it is time to move forward with trust and openness. You are at the beginning of an adventure, stepping through the gates of the unknown into endless possibilities. As you move through the portal, know that your guides will protect you. Call on them; establish a relationship of trust with them, for they will guide you on this adventure. The lessons you learn on your journey will empower you to trust and touch the heart of your pure self. Empowerment: Quester is empowered by being spontaneous and optimistic about the issue in question. Reversed: When Quester comes up reversed, it is time to move beyond your comfort zone. As a block, Quester is advised to stop and evaluate before moving through the portal. Is Quester afraid to move forward due to lack of trust about the situation, or is the situation too risky to move forward? Look at the other cards in the reading to understand if it is fear or caution that is holding you back. Numerology: Quester has been assigned the number 0, which represents unlimited possibilities.